Runners donated to Sandy victims gear they were going to ditch at the starting line of the cancelled NYC Marathon. Published in City Limits, November 4, 2012. The runners tossed blankets, gloves, jackets and other gear onto the pile, each leaving a piece of where they came from. A French man donated his running shirt and pants, and noted that they were designer wear. 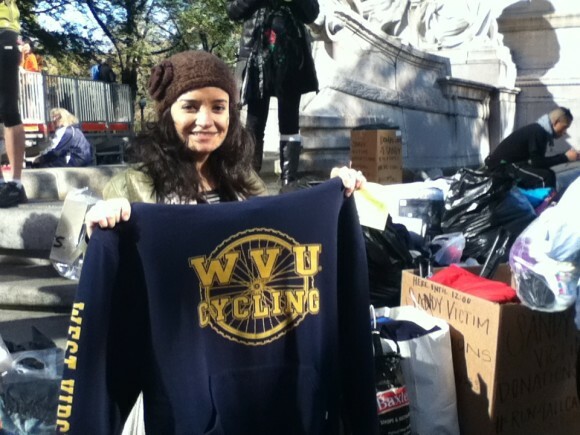 Enybe Merritt, 32, contributed a West Virginia University Cycling sweatshirt. “Since I can’t run anyway, I’ll help, continue to help and go home,” Koh said. This entry was posted on Friday, November 9th, 2012 at 3:19 am. It is filed under Print. You can follow any responses to this entry through the RSS 2.0 feed.